CA: Sue, can you tell us a bit about your project? Sue: Yes, and thank you for inviting me here to talk about my work. 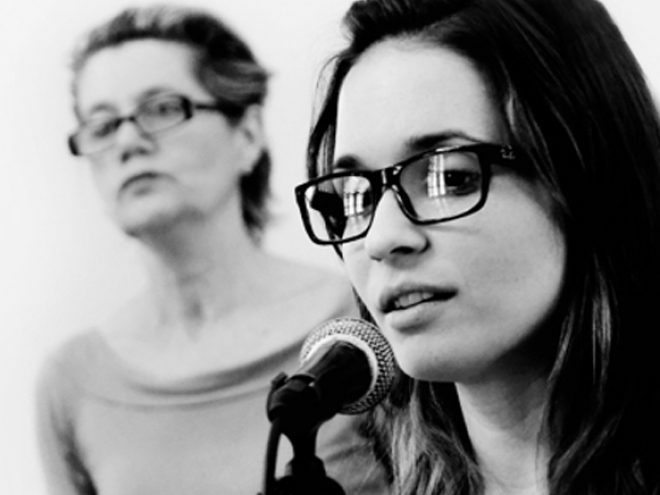 UP INTO THE SILENCE (UITS) was a performance that we gave here in Havana in June, 2012; a concert of my music (songs) set to the poetry of the great American post-modernist, E. E. Cummings, and sung by Cuban artist, Diana Fuentes. It was the second concert produced by our team – QUIET NIGHTS CUBA. (QNC is myself – as composer & Artistic Director, Darsi Fernandez and Yoana Grass (Producers), and Idania del Rio (Designer/Visuals). We also work with Denis Peralta (Musical Director), Alejandro Lugo (Musical Productor), Alfonso Peña & Scorpio (Design/Recording of the live 5.1 surround sound) and Luis Najmias Jnr. (Film & DVD Director). CA: Why poetry, and why E. E. Cummings? Sue: Well, it began in 2002. I took one of Cummings´s poems – just as a musical exercise – then completely fell in love with it, set it to music (as a song – just piano and voice ), and then – without any plan at all – spent the next 4 years writing just to his work! Complete instinct, really. I finally stopped in 2004 when I had a cycle of 13 songs that I felt really happy with. And then – with Diana (Fuentes), who was, then, just beginning her career – we recorded a demo of six of those songs. We won a music prize here, with that demo. Since then – with the release of her own solo albums – she´s shot to fame; has just been signed by Sony. She´s a very fine, sensitive, singer and artist, and lovely to work with. CA: So what made you return to this project – after a break of 8 years? Sue: Well…yes…fast forward to the very beginning of 2011. One night Diana and I were chatting on Facebook – she was living in Puerto Rico by then – and just very spontaneously we both decided we´d like to go back to this project; to do a proper concert of the original Cummings songs. So I set to work. As I said, all of the originals were just for solo piano and voice but since I´d been working a lot with more electronic and home-made sounds – a work I love to do with sound-man/ experimenter, Ale (Lugo) – I reworked many of them to include that, newer, side of my work. I also changed the format – using piano, but also a live string quartet alongside small, and quite fragmented, pre-recorded sounds, for example – to be played live on drum pad and keyboard. The combination really worked, I think – it was certainly something very different for here. Sue: Well, I start out with the music/concert/project idea then start brainstorming it with Idania (del Rio). She´s such a star, thinks right outside of the box, quirky, so very talented. Then, we´ll meet with both Darsi and Yoana. Then…well, it’s just developing the work. Me and Alejandro, me and Denis, team meetings…and on and on. UP INTO THE SILENCE took a couple of years of really solid team work and involved – wonderfully, for us – some of the very best musicians, filmmakers, photographers, designers, actors, sound engineers, translators and producers on the island. An amazing team. We were really proud, then, not only to have created what we consider to have been a beautiful music/visual project (with rotating overhead projectors, mapping effects etc.) but to have also brought the work of Cummings to Cuba; to an audience who previously had no, or little, knowledge of his incredible poetry. We have to thank Cuban poet, Omar Perez, here, for his really meticulous and fine translations – not easy with Cummings. And then someone who most Cubans consider to be their finest actor (as well as their finest comedian, by the way! ), Osvaldo Doimeadios: a brilliant artist who recorded some of the poetry in Spanish – that we then used in the live concert. The team – QNC – have always felt, too, that we were about something bigger than just a concert or a project; something that is, sincerely, very important to us. And that’s to be part of a movement of intercultural exchanges. Interestingly, both of my projects so far have linked the USA and Cuba. There seems to be no cultural bridge like music and – this time – it was accompanied by some of the most important and beautiful poetry ever written. CA: We know that it’s quite unusual for a foreigner to have their work supported here, in this way. How did this happen? Sue: Yes, it is – and I´m not just incredibly grateful for this – but also, I have to say, made very proud to be a permanent Cuban resident. Cuba is very rich in culture – as you well know – but it´s a poor country and so the commitment to supporting us artists – and UITS, in this instance – is even more remarkable, I feel. And last year I was also lucky enough to be accepted as a member of UNEAC (the Music & Artists Union) which is a great honour. It’s a very prestigious organization here and it means I now belong to an official artistic institution – a great support for me and for my work. So, what happened is that we presented UITS to two institutions: Producciones Colibrí and Producciones Ojalá – with great help from Ernán López-Nussa – and, luckily, both companies loved it. Of course, then having Diana (Fuentes) and Aldo (López Gavilán) on board – both very well-known and respected young musicians – was key. Plus, having Darsi and Yoana who are simply, in my view, the best producers around. So I am eternally grateful for all this, and to all of these people. For readers who aren´t familiar with the Cuban music scene Colibrí and Ojalá are two very fine, small, Cuban record companies/labels: Colibrí is part of the Cuban Music Institute and Ojalá is owned by one of Cuba´s most famous musicians, Silvio Rodríguez. We had other, great, support: from Aurelia Productions, from tourist agencies CTN and Cubania, and from Hector Higuera – owner of the fine restaurant, Le Chansonnier. I also want to thank you, CubaAbsolutely, for helping us promote the concert, and another on-line Cuban music company, Suenacubano, too. CA: Where was the concert performed? Sue: We gave two concerts of the work in Cuba´s biggest theatre – Karl Marx – but we closed down the main part and set everything thing in the round – public and artists – just on the theatre stage. (That original idea came from Ernán López-Nusa – one of Cuba´s finest jazz pianists – and was a real stroke of genius). The team there were stellar. And – thanks to Peña (plus Delio and Carlos, of Scorpio Sound Team) – we had this amazing, specially designed, live, 5.1 surround sound, too. The stage-floor visuals and mapping was inspired work from Idania and Mauricio Abad (another very talented, out-of-the-box thinker, there). And all this – the setting, the visuals and the sound – were a first for the theatre, and for the Cuban public – so all of that was pretty exciting. Doing something new is definitely very much part of any project, for us. CA: Were you happy with the outcome? Sue: Oh yes, very! I mean, there are always little things. In the second concert something happened with the lighting. Then I think the stage-floor visuals – which look so amazing on the DVD – were not that easy, live; the audience would need to be seated higher up, looking more downwards, and we couldn’t find a way. But overall…it was very delicate and beautiful, I think, and the audience was very enthusiastic. Diana sang like an angel and we also had two very fine pianists: the lovely Aldo López-Gavilán, and a younger, emerging talent, Darío Martín. Denis (Peralta) was outstanding as a MD, and also conducted a wonderful string quartet (I can´t wait to work with them again). And, as in our first concert, we had friends Marietta González (keyboard) and Mauricio Gutiérrez (percussion) with us. Great people. It was a small, intimate, minimalist event – quiet, spacious, rich colours, floating melodies, breath, fragmented sounds ….and silence. Magical, really. CA: So then, on to the DVD and the premier on September 28th. Sue: Well, we decided early on that we wanted to film the concert and create a high-quality DVD. And we were lucky enough to work with Luis Najmias Jnr. (a multi-prizewinning director) who both filmed (nine cameras!) and produced this DVD – which, as you´ve said, includes a short Making of….plus the concert itself. Our only sadness with the live concert was that we were only able to offer two performances and I think there was a maximum of 300 people in each one. So many people, who really wanted to see it, missed it. But now – at least – we have the chance to show it to you as an HD DVD in the best cinema in town – Cine Chaplin – and with the best possible sound: we´ll set up the 5.1 surround sound there to give you the closest experience possible to the live concert. And the whole context for this, of course, is the Leo Brouwer Festival. It’s not just a wonderful opportunity for us – to show the work in Chaplin – but, for me personally, a complete honour to be included in this particular festival. It´s one of the most prestigious and respected events in the Cuban cultural calendar and, well, I´m extremely grateful, very happy to be there. Sue: That I think we´ve achieved something new and quite beautiful with UP INTO THE SILENCE and that we, as a team, are all really proud of the outcome. Quiet Nights, and UITS, is not just me – it’s a core team, and a really fantastic one. We´re a permanent fixture now and will probably produce another project together in 2014. And The UITS DVD that you´ll see on September 28th actually won two CubaDisco prizes this year, too! One was for the best DVD of a live concert; the other for the best setting of poetry to music. So I hope you´ll all come to celebrate this with us – to support us – to enjoy it – and to chat afterwards and tell us what you think! And, thanks – so much – to everyone. Saturday, September 28th, at 5pm – Cine Chaplin, Calle 23 y 10, Vedado. Sue will be there to introduce the screening – along with some of the musicians and production team involved in the project – and there will be a special appearance from actor Osvaldo Doimeadios who will read selected poetry by E. E. Cummings.